Since “Toy Story” was first released in 1995, Pixar has become a cash cow among audiences. Children and families alike love the animated films, many of them becoming instant classics. That said, just about anyone who has seen a few of these movies no doubt has a favorite movie among the bunch. It’s like picking pizza…even the bad ones are still good, but for me, one of my personal favorites has always been 2001’s “Monsters, Inc.” How then can you go wrong with a prequel? Ever since he was a young, little monster, Mike Wazowski (Billy Crystal) has wanted one thing more than anything else. He wants to go to Monsters University and get his degree in Scaring, hoping to ultimately become one of the all-time great scarers. Mike eventually does get into MU, devoting himself to learning the ins and outs, every little thing he can about becoming the best monster he can be. He meets another freshman, James “Sully” Sullivan (John Goodman) who seems to get by on his family name and a natural ability to scare. The two freshmen become fierce rivals, but when they get on the wrong side of some of the school administration, they have to team up. 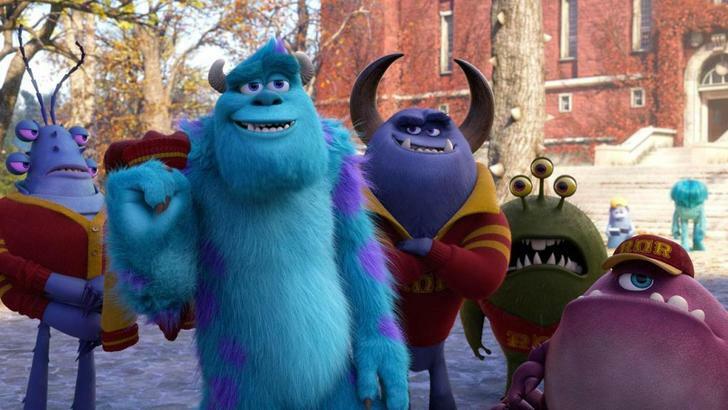 Can Mike, Sully and a handful of members of a nerdy fraternity on campus work together to win the famous Scare Games? Made 12 years after the original, ‘University’ gets at least a partial pass just because it’s fun to see these characters we love back again for more. It’s great to see Mike and Sully, see how they met and eventually end up at Monsters, Inc. where we saw them in the first movie. It’s cool to see the introduction of some other characters we’ve met prior, not to mention a solid list of other characters we’re meeting for the first time. Thankfully though, director Dan Scanlon doesn’t go for the status quo. Is another Monsters movie even necessary? Over a decade later….no, not particularly so Scanlon comes up with a gimmick that ends up working really well; the prequel. Instead of some retread sequel, we get an enjoyable, worthwhile prequel. It sounds obvious to give credit where it’s due, but it felt refreshing to see an original prequel rather than a well-worn, comfortable (if dull) sequel. Point to you, Mr. Scanlon. As is the case with all the Pixar movies I’ve seen, the voice casting is impeccable again. The pairing of Billy Crystal and John Goodman as Mike and Sully is pretty perfect. Crystal’s higher-pitched, almost nasally voice at times is a natural fit with Goodman’s deeper, almost baritone voice. Also, seeing them as enemies rather than friends is a cool, surprising twist. 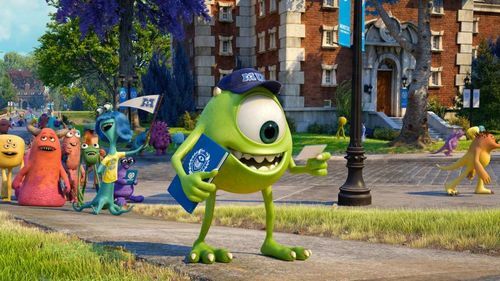 The visual doesn’t hurt either; Mike a small, gangly green monster with one enormous eye while Sully looks like a teddy bear on steroids, immense and tall with blue fur and pink polka dots to go with his horns. Forcing the duo to work together was a nice touch as well, giving the story a bit of a lesson for its younger members of audiences without being really obvious or overly heavy-handed. LISTEN to the MESSAGE! It never feels like that. Mike with his stubborn edge and thirst for more, Sully with his natural ability and self-confidence, it’s a monster match made in Heaven. The rest of the cast in the voice department doesn’t disappoint either. Returning (pre-returning?) from ‘Inc.’ is Steve Buscemi as Randall, Mike’s roommate who can turn himself invisible and hasn’t quite created that mean, evil streak we see years later. Helen Mirren is a welcome addition to the cast as Dean Hardscrabble, the legendary dean of MU who comes to work against both Mike and Sully with Alfred Molina as Professor Knight, the teacher in Scaring 101. Nathan Fillion is a solid choice to play Johnny Worthington, the All-American college guy and head of the fraternity that’s always the coolest on campus. Also look and listen for the voice talents of John Krasinski, Tyler Labine, Aubrey Plaza, Bonnie Hunt, Bill Hader, Bobbie Moynihan and Pixar mainstay, John Ratzenberger (as the Abominable Snowman) in supporting parts. 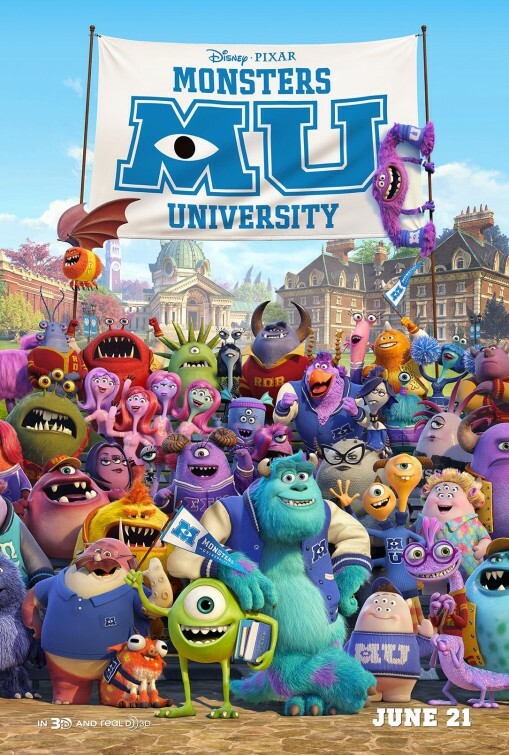 The best thing to come out of this 2013 prequel though is the handful of characters we meet at Oozma Kappa, the nerdy, disrespected fraternity Mike and Sully are forced to join to be eligible for the Scare Games. The group includes Don (Joel Murray), a 40-something salesman who went back to school for a new job, Squishy (Peter Sohn), a nerdy, quiet youngster looking for friends, Terry (Dave Foley) and Terri (Sean Hayes), a two-head monster, one who wants to dance and the other to study, and Art (scene-stealing Charlie Day), the goofy, off-the-wall monster with an odd past who also looks like a Muppet. Obviously, part of the appeal from the OK Fraternity comes from their physical appearance which proves difficult to describe, but check out the visual HERE. The genuine friendship, the bonding, this key introduction of the OK characters goes a long way and for the better, great additions to the story. So we’ve made it this far, and I haven’t really mentioned the visuals here other than the appearance of the many different monsters. Pixar did it again, producing and making an incredibly visual film, full of color and excitement, deep and rich to the point some shots look like paintings. Mostly though, reviews for Pixar films could be done quickly and capably. It’s good — sometimes really good — and you will no doubt get some really solid laughs and enjoyment out of it. ‘University’ isn’t on par with the original, but it’s a worthy addition to the Pixar archives for sure. A very solid prequel to a classic. The Pixar short before the movie, The Blue Umbrella, is okay but nothing special. The ending was much more realistic than I thought it would be; it’s not often that you see an ending like that in a family film. Can’t wait for the next REAL Pixar movie (The Good Dinosaur).